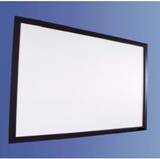 Explicit Floor Screen - Portable floor screen w/ black borders, PET or PVC fabric. Explicit Frame One - 80mm aluminium alloy frame. Supreme Velvet Feel - frame screen with the surface covered by well-finished black velvet.